Water babies - grab your gear and get moving to Somerset Dam. Approximately one hour from Brisbane in Somerset , and neatly cradled by a ring of surrounding hills, conditions there are perfect for water skiing, wake-boarding, sailing and fishing. The dam has a serious role to play as one of Brisbane's most important water catchments but when the sun is shining, the boats are out and the folks are splashing around, it's strictly a carefree zone. 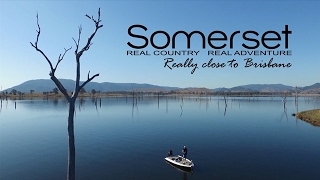 Somerset Dam has excellent camping and boat ramp facilities and is a perfect base for touring the surrounding towns and countryside. It's the perfect playground for short breaks or longer vacations alike.